Retail $5.99 SAVE 17% ! "When they say Super Thin..."
...they ain&apos;t joking. Like water. Wets out surfaces/fibers without beading up. This is what I was looking for. When they say thin they mean thin. It flows great and works great. Hold the parts together add a drop of this and done. If you have never used this glue, well it is very thin and it runs. Just saying that because you could get glue where you do not want it. But it works great. I was changing the dog house on the 57 rio wagon with the 58 edsel dog house, and used some flat styrene to mate them together and it worked like a charm. Cannot wait to try it on other projects. This CA is a very good one. This is specially thin, so it goes inside any little crack. This is a Pro. A Con is that it spreads easy out so you need a firm hand to work with it. 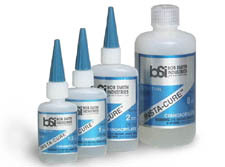 If you use a Cyanoacrylate tip attached to the tip of the bottle, it will be much easy to work with. Very recomendable, but remember it flows easyly so it is not for all the labours. It dries fast, fast. Be careful. As usual another fantastic product that works awesome!!! Thanks Hobby linc.